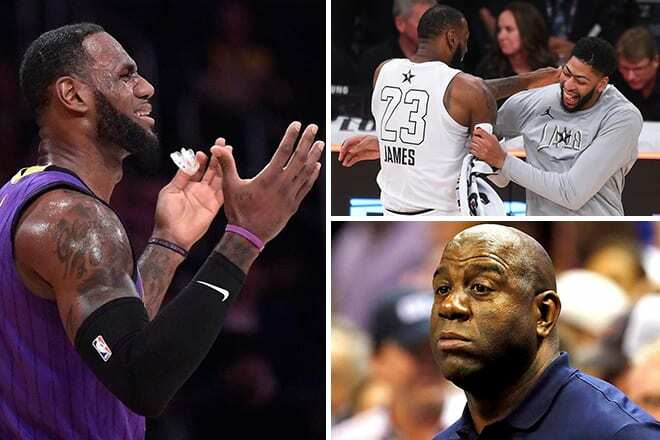 You are at :Home»Sports»LeBron James Playoffs: Los Angeles Lakers star misses NBA post-season for first time since 2005… what went wrong, why didn’t they sign Anthony Davis and what happens next? LeBron James Playoffs: Los Angeles Lakers star misses NBA post-season for first time since 2005… what went wrong, why didn’t they sign Anthony Davis and what happens next? LeBron James Playoffs – Detractors of ‘King James’ will certainly point to his 2019 post-season shortcoming in the debate regarding the greatest basketball to ever live, as the Lakers have officially been eliminated from NBA play-off contention following a 111-106 defeat at the hands of Brooklyn Nets. D’Angelo Russell, the player the Lakers gave up on after two seasons, proved decisive. The Lakers drafted him with the #2 pick in 2015, only to trade him to the Nets in 2017 as a sweetener to offload Timothy Mozgov’s disastrous $64m contract in order to clear cap space to sign LeBron. Russell silenced the Staples Centre crowd with 21 points and 13 assists, with Joe Harris going six-for-six on three pointers en route to racking up 26 points as the team’s leading scorer. LeBron James fell one rebound short of an 81st career triple double, ending the night with 25 points, 14 points and 9 rebounds. Outside of Javale McGee’s monstrous night, who had 20 boards and 33 points of his own, the Lakers were unable to keep their faint post-season hopes alive. The Lakers are now 11 games behind #8 seed San Antonio Spurs with just 10 games remaining. The Lakers will miss the post-season for a franchise-record sixth straight season, so, where did it all go wrong? Why did the Lakers miss the 2019 NBA play-offs? Before this season, he had made the NBA finals in every year from 2011-2018, but ‘LaBron’ has not quite gone to plan for a number of reasons. The wheels began to fall off on Christmas Day, as the Lakers thrashed the Golden State Warriors 127-101 but lost LeBron to injury for the next 17 games. Before the former Cleveland native went down with a strained left groin, the Lakers were fourth in the Western Conference with 20 wins and 14 defeats. Since that festive affair, Los Angeles’ marquee franchise have posted an 11-27 record on the back of a five-game losing streak. Without LeBron, the Lakers have lacked a go-to scoring option. The modern NBA dictates that a superstar needs at least two other ‘All-Star’ calibre players in order to win rings. In Miami it was Dwayne Wade and Chris Bosh. In Cleveland he had Kyrie Irving and Kevin Love. As a member of this Lakers team, he has… Lonzo Ball? This past off-season saw the Lakers add a number of veteran players to one-year deals, with Rajon Rondo, Javale McGee, Tyson Chandler and Michael Beasley among those to join, much to the chagrin off baffled fans, who wanted another marquee signing and not seasoned veterans. Therefore, it’s fair to say that LeBron James playoff failures can partly be linked to the Anthony Davis trade fiasco. Why didn’t the Lakers sign Anthony Davis? Anthony Davis, widely regarded as one of the five-best players in the NBA, declared that he wanted out from the New Orleans Pelicans but a move to the Lakers never materialised, despite sharing the same agent with LeBron in Rich Paul. The Lakers could make another push to trade for him in summer but they had an almost exclusive opportunity to sign him before the trade deadline. The Boston Celtics are also in play to sign Davis, but cannot sign him until summer because of the ‘Rose Rule’, named after former Chicago Bulls MVP Derrick Rose, as he was the first player to come off his rookie-scale deal and earn 30% of the salary cap, as opposed to 25%. The Celtics already have Kyrie Irving on their books under the ‘Rose Rule’ until summer, giving the Lakers a small window to sign Davis. In fairness to Magic Johnson and the Lakers front office personnel, they literally threw the kitchen sink trying to sign Davis but came up short. The team made six offers in total, with the final proposal including two #2 picks in Lonzo Ball and Brandon Ingram, Kyle Kuzma, Rajon Rondo, Lance Stephenson, Michael Beasley and two future first-round draft picks. When a franchise basically makes it entire roster available for a trade, those mentioned as trade bait will no doubt be left feeling expendable and are likely to feel an added layer of pressure when they play, as they are not only fighting for a play-off spot but also their future with the franchise. Of course, you won’t hear too many admissions of such, but just imagine if your boss came up to you and said ‘we’re trying to get rid of you for someone more skilled, but we couldn’t make that happen, so now we need you to go out there and give everything for a franchise that would’ve shoved you out the door if they had the chance’. Not exactly the most productive working environment for a team that already faces huge pressure given its storied history and huge market appeal. All offers from the Lakers, lead by team president Magic Johnson, were rejected by the Pelicans, who were encouraged by other teams, including Spurs head coach Gregg Popovich, to hold firm and not trade Davis to the Lakers, arguably one of the league’s two most marketable teams, alongside the New York Knicks. Davis made it clear he wants to play for the Lakers, but Boston also remains a possibility. The feeling was, if the Lakers couldn’t wrap up a deal for Davis now, it would become even harder in summer, where more potential suitors can come into play. The old-age NBA ‘GOAT’ debate will no doubt re-open again and doubters of LeBron will quickly point to the fact that Michael Jordan never lost three consecutive games in his entire career. On top of that, much of LeBron’s dominance has come in the Eastern Conference, widely regarded as the ‘easier’ conference to play in (Jordan also played exclusively in the Eastern Conference but the competition back then was much higher). LeBron went out West and didn’t make the play-offs. To some, his injury explains why this season became so derailed. To others, it’s clear proof that whilst LeBron is a surefire legend, he is not quite the best player to ever play basketball. Then again, even if LeBron did make the play-offs, the Jordan-Lebron debate would be reignited regardless, but this time, the argument leaves much more in favour of the former rather than the latter. Kevin Durant, Kawahi Leonard, Kyrie Irving, Klay Thompson, Jimmy Butler and Kemba Walker are among the flagship free agents on the market this summer, so the message is simple: sign at least one of these All-Star’s to pair alongside LeBron James, or risk wasting the last remaining elite years of one of the league’s greatest-ever players.